According to Sheera Frenkel, Israeli officials were made aware by Saudi Arabia of the backdoor talks between the US and Iran detailed in depth by Laura Rozen at Al Monitor this past weekend, which culminated in the interim Geneva agreement. In brief, the deal will see Iran recoup some US$7-8 billion in sanctions relief through 2014 if, in exchange, Tehran does not enrich any more uranium over 5%, allows for new IAEA site inspections, and downgrads its remaining enriched-to-20% uranium stockpile. Some outstanding issues, like the Arak heavy water reactor under construction and Iran’s “right to enrich,” remain to be discussed in talks down the road. Saudi Arabia would not have been a venue for these talks, of course – nor would its closest GCC associate, Bahrain, given the Al Khalifas’ mistrust of the Islamic Republic – but other Gulf states were. Namely Oman — which the US uses as a third party to approach untouchables like the Taliban and the Islamic Republic — and perhaps the UAE as well (unlike its Saudi neighbors, the Emirati Cabinet very quickly welcomed the interim accord). News of the meeting went from these states to Riyadh and then probably got to Tel Aviv, obviously infuriating the Israelis because they were not told up front about the talks. So, if the Israelis did know weeks in advance, that makes Netanyahu’s intransigence this past Fall more explainable. Appraised of the progress being made in the talks outside normal channels, he was nonetheless unable to make public Israel’s foreknowledge of the deliberations. He is not so reckless as to think he could get away with letting the cat out the bag like that; doing so really would cause significant damage to US-Israeli relations. He had few options to confront a process leading to a deal he opposed because it did not dismantle all Iranian nuclear capabilities. He and his supporters leaned on the most receptive audiences they had: the US Congress, the French Foreign Ministry, and the Sunday talk show circuit, making the case that no deal would be better than a “bad deal”. Some officials gave Yedioth Ahronoth and Channel 10 details of US-Iran meetings that showed the backdoor to Iran was in place for at least a year. These reports, however, did not affect the pace of the negotiations or public opinion. Netanyahu now has to worry a lot more about the home front, where he faces members of the security establishment expressing support for the deal, politicians outside his coalition criticizing his criticism of Obama, and his reappointed Foreign Minister, Avigdor Lieberman, breathing down his neck. Even the Israeli stock exchange seems to be weighing in against him: its ongoing rally, which began days before Sunday, was not adversely impacted by the deal. But worst of all from Netanyahu’s perspective, is that in offering sanctions amelioration, Iran seems to gain legitimacy in international affairs (for Saudi Arabia, this fear is also felt, and directly connected to the outcome of the Syrian civil war). This deal is a stopgap measure meant to halt Iranian activities while negotiations continue, so it is not an economic godsend. Chip away at the sanctions regime, and Iran’s economy could start to see results, which is especially important for the leadership if this deal leads to a lasting agreement. But it is the prospective dilution of these sanctions (not their financial bottom-line) that deeply disturbs Netanyahu, whether you believe he is serious about it being 1938 all over again or not, because it raises the possibility that Europe and the US will defer less and less to his demands to keep Iran diplomatically and economically isolated. 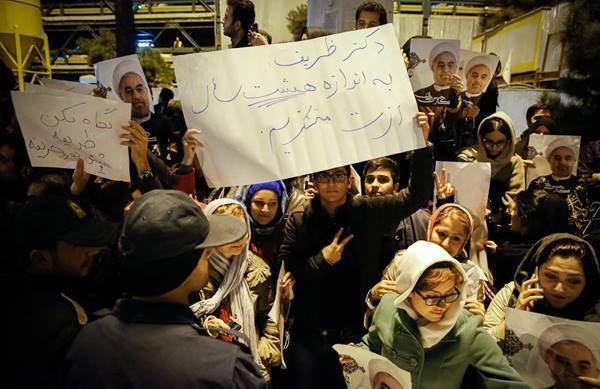 The public mood in Iran is mixed between caution and acclaim. The returning negotiating team was feted, and did not seem to draw the sort of hecklers who came out to greet President Rouhani when he returned from the UN. As Golnaz Esfandiari reports, crowds waiting for Iranian Foreign Minister Zarif in Tehran chanted “Kayhan, Israel, Condolences, Condolences” (Kayhan is a hardline newspaper, which like other conservative outlets close to the Supreme Leader emphasized the “flexibility” aspect of the interim deal, downplaying Iran’s concessions – in part because the deal is vague on recognizing the “natural rights” of Iranian nuclear work – and the impact of the sanctions thus far). But overall, the reception in the media was positive and the deal is a loss for the ultraconservative arm of the Islamic Republic’s leadership, which would like to pretend the Revolution is still ongoing. By agreeing to the terms of the deal, Iran is electing to participate in the international system on that system’s terms (unlike fellow nuclear pariah North Korea). And if economic relief can develop further, even more Iranians, perhaps, may begin to wake up to the fact that the sanctions have been exploited inside Iran to greatly enrich not just certain businessmen and politicians, but the twin pillars of the state itself: the Supreme Leader’s office, and the Revolutionary Guards. His next feature film, The Great Budapest Hotel, which comes out in March, takes place in its titular location. His new short film Castello Cavalcanti [seen above], too, takes place in its titular location, a hamlet tucked away somewhere undisclosed in Italy. Then again, hasn’t Anderson, aesthetically and referentially speaking, always enjoyed something of a European period? (Maybe we can call it European by way of his native Texas, which, for me, only adds to the visual interest.) This, combined with his apparent fascination with the objects and built environment of the early- to late-middle twentieth century, has won him a great many fans sympathetic to his sensibilities. (Along with, of course, a handful of detractors less sympathetic to them.) This brief but vibrant new piece should, for them, resonate on several levels at once. Starring Anderson favorite Jason Schwartzman, an American who crashes into a piece of his own past, the short is—like so many Wes Anderson ads—also an opportunity for Anderson to pay tribute to his cinematic ancestors. Specifically, Castello Cavalcanti seems to be full of nods to the work of Federico Fellini. (Another director, by the way, who made commercials.) In The Wes Anderson Collection, Anderson cites Fellini as an influence for his work in caricature. Here, the caricatures are all over town, but the Christ statue in the center seems to have been air-lifted from La Dolce Vita, alongside the motorcycle-riding paparazzo, and the car race itself seems to be an homage to the car race in Fellini’s Amarcord. And it’s not just Fellini: The title character seems to be named after Brazilian-born director Alberto Cavalcanti, of whom Anderson is a fan. My bet is that, as explicitly stated by Chipotle, Prada is trying to reach a generation of young consumers who don’t necessarily sit through commercials on TV. And if you’re not going to shell out for a high-dollar spot during, say, the Super Bowl, you have a lot more money available to pay top directors and actors to make interesting, 8-minute films that people will go out of their way to watch. Isn’t that more fun? Previous Dish on Anderson here, here, and here.